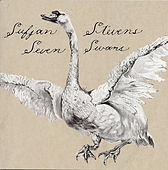 On 2003's Greetings From Michigan, singer-songwriter Sufjan Stevens created a lush orch-pop ode to his native Wolverine State that proved all but impossible to pull off live. The quietly beautiful Seven Swans shouldn't have the same problem: Here the twenty-eight-year-old Brooklyn resident employs his warm, creaky baritone over rafts of banjos and acoustic guitars. The plaintive "Dress Looks Nice on You" could be a Nick Drake cover; on the opening track, a meditative banjo arpeggio climbs uphill against a building chorus of vocals. Producer Daniel Smith, a member of the quirky Christian indie-rock band the Danielson Famile, keeps the album lively with a series of change-ups: "He Woke Up Again" pairs banjo with a Farfisa organ, and "The Transfiguration" backs an epiphany-inducing melody with xylophone. Even if Bible thumping isn't your thing -- it is Stevens', as lines such as "The voice of God, the most beloved son" attest -- it's hard not to be taken with Seven Swans' poetic splendor.